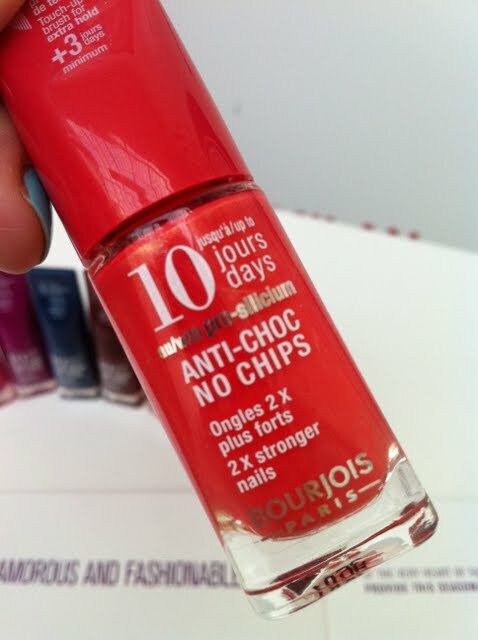 Yesterday I went along to the Bourjois offices to check out some of their latest launches – there are so many! I can’t help but get totally over excited when I see lots of new colours and products so wanted to share a few snaps I took with you. 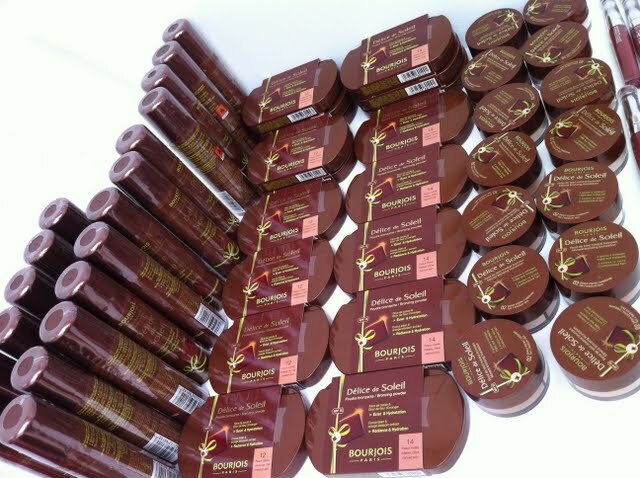 New Bourjois bronzing products for Summer. The bronzing products are really interesting, there’s a bronzing spray that can be used on the face or body – available in two shades, it sprays a light mist of very fine bronzing powder and looks really natural. 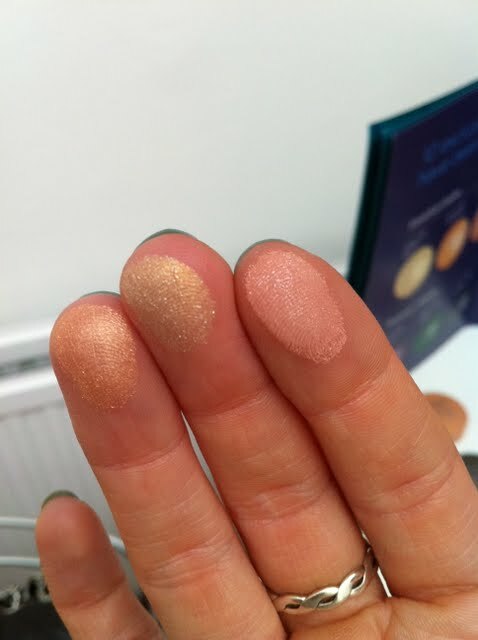 There’s a bronzing compact that comes with a clever swivel mirror and a two part mineral bronzer that is half a deep tan and half a neutral/white sort of shade – you can dispense the powder in different ratios to find the shade that matches your skin – this is amazing if your skin tone varies from Summer to winter, you can adapt this product to suit. New little round pot ‘Intense’ – more pigment, more compact size. 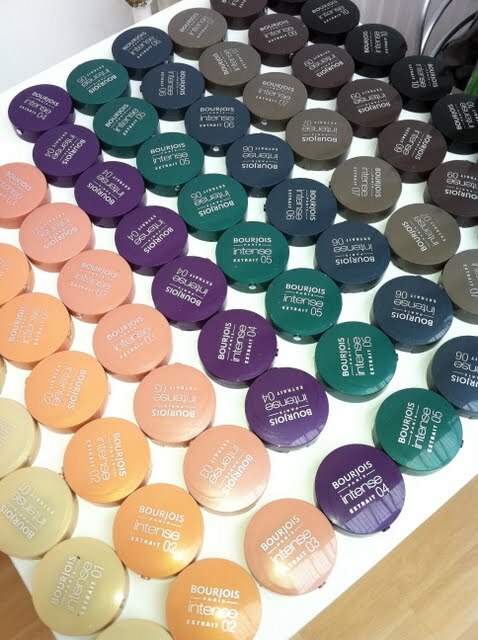 New, more ‘intense’ versions of the classic Little Round Pots – more intense pigment and smaller sized pots (that close with a magnet rather than the button/clasp release of the Classics) these really are amazingly pigmented – check out the swatches I snapped further down the page. These are all one light swipe of the powder…. 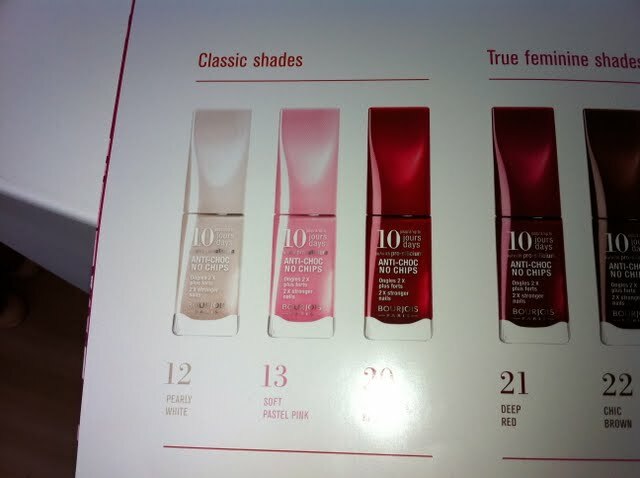 The new long lasting nail colours…. 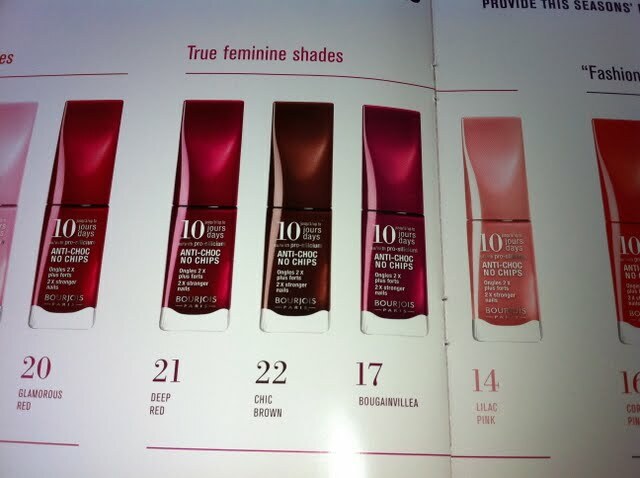 again, a range of shades. Not quite the same colour explosion as the Oh So Laque ones…but there are some lovely ones in there. Including the coral on the left of the picture (this was my favourite) I also love the deep navy blue. LOVE this shade (if you like the look of China Glaze ‘For Audrey’ but can’t find it, then check this out! A gorgeous red-toned coral with a pretty golden shimmer. Can’t wait to try. 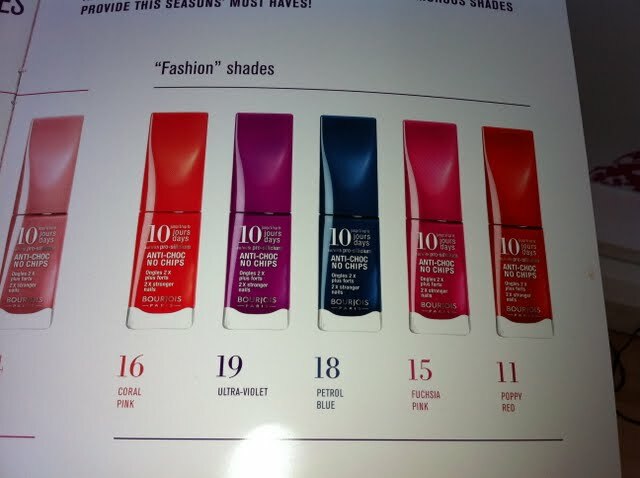 The rest of the shades that are available from the 10 day no chip polish range (promises 7 day wear, then the brush is designed to allow for easy touch-ups of tip wear or small chips, to extend it to 10 days) just to give a bit of an idea of what’s available. 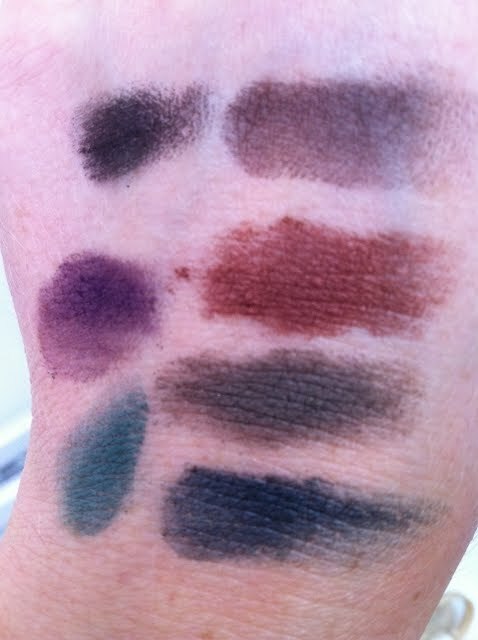 So there we have a whistle stop tour of the latest from Bourjois – what do you think? Anything screaming ‘Buy me’ to you?? Oooh i want the coral no chips polish! Loving the look of the bronzers and intense pots! When are they due for release? Exciting! i want the bronzer! when’s it out in stores?! The bright nail polishes look great! I usually love their colours but not their shelf-life. I find they go thick really quickly!! I hope they’re changed the formula!